Western blot analysis of extracts from various cell lines using AKAP5 (D28G3) Rabbit mAb. 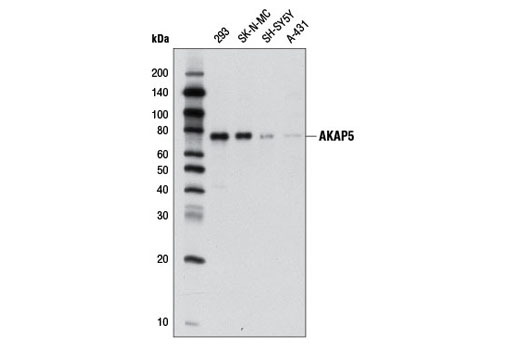 AKAP5 (D28G3) Rabbit mAb recognizes endogenous levels of total AKAP5 protein. This antibody does not cross-react with other AKAP family proteins. Monoclonal antibody is produced by immunizing animals with a synthetic peptide corresponding to residues surrounding Arg383 of human AKAP5 protein. AKAPs (A-kinase anchoring proteins), as their name implies, are a family of scaffolding proteins that bind regulatory subunits of Protein Kinase A (PKA) thus localizing PKA activity to distinct regions of the cell (1). Beyond a common amphipathic alpha helix that is responsible for recruiting the PKA regulatory subunit (RIα, RIIα, RIβ, or RIIβ), individual AKAPs contain additional domains responsible for the recrutiment of additional signaling proteins (phosphodiesterases, phosphatases, cytoskeletal components, other kinase, etc.) or restricting AKAP to a specific subcellular location (1). AKAP5 (also known as P75, AKAP75, or AKAP79) is predominantly expressed in neuronal tissues and cells where it serves to localize type II PKA to post-synaptic densities (2-4). AKAP5 specifically binds to the regulatory subunit of PKAIIβ, anchoring the enzyme to the plasma membrane and sites of cytoskeletal/membrane junctions (4-5). The other binding domains of AKAP5 have been shown to interact with calmodulin, PP2B, and calcineurin suggesting that AKAP5 may act to coordinate the cAMP- and Ca2+-sensing pathways in various cell types (5-8). Schwartz, J.H. (2001) Proc Natl Acad Sci U S A 98, 13482-4. Bregman, D.B. et al. (1991) J Biol Chem 266, 7207-13. Hirsch, A.H. et al. (1992) J Biol Chem 267, 2131-4. Carr, D.W. et al. (1992) J Biol Chem 267, 16816-23. Glantz, S.B. et al. (1993) J Biol Chem 268, 12796-804. Klauck, T.M. et al. (1996) Science 271, 1589-92. Sarkar, D. et al. (1984) J Biol Chem 259, 9840-6. Coghlan, V.M. et al. (1995) Science 267, 108-11.